As a trail, Shark Valley isn’t what I’m typically looking for. That’s why I almost skipped it! However, as an overall experience it was definitely worth it. If you are considering a visit, I recommend you do it, and that you spend a little more time savoring it than I did. Shark Valley is one of the most crowded places in the Everglades National Park, at least in the morning before the sun becomes unbearable. A large parking lot adjoins a small visitor’s center which also houses a bicycle rental concession. The way to see this place is definitely by bike, if you are able, though you might want to bring your own if possible. After standing in line to pay for our rental, we began the process of finding a couple bikes that fit us (the seats are not very adjustable) and that weren’t obviously broken. We never found a pair of perfect ones, but by switching rides halfway through at least we didn’t both have to put up with the same faults the whole way! The 15.8-mile loop trail itself is asphalt with a gravel and grass shoulder, and traffic for bikes and trams is one-way only. The first couple miles saw a lot of foot traffic, but that waned after a while. As usual in this country, the trail is perfectly flat. Getting to travel all that way through this seemingly endless grassland is part of the appeal of the trail. It is one of the few places in the park where you really get a sense of the vastness around you, while remaining in a developed area. If you don’t have the time, money, or ability to bike, and you want to see more than just walking, you can also take a tram tour run by the park concession. It runs along the same trail and stops periodically to see the sights and for the naturalist to impart some information. It goes out to the observation tower, but you’ll have to walk up the tower yourself to take in the view! The covered tram is a nice way to avoid the sun and the wind, because there is no shade or shelter for bikers or hikers along the way. The Observation Tower is at the southern end of the trail, and you should check this out before you turn around and head back north. The tower is made of reinforced concrete and it is ascended via a long walled-in ramp, followed by an open spiral staircase if you want to get to the upper level. The walk alongside the crowds reminded me of filing into a pro baseball stadium on a hot summer day! It is pretty crowded, so we had to wait our turn to get a spot at the front of the wall. Once we did, however, it was a wholly different experience to see the Everglades from above! We were able to watch fish and alligators swimming in the pond below, while birds soared across the plains. The “river of grass” that we had read about became suddenly apparent, in a way that posters and panels could never make clear. Despite the jostling visitors around me, I’ve managed to keep a memory of peace and silence as I looked out across that vista. While the view from the Shark Valley tower is impressive, the more fun part of the ride is all the wildlife alongside the trail (note: no sharks). If you have a pair of binoculars, you’ll be able to see even more. For the first couple of miles, we stopped every time we saw an alligator or an anhinga, but eventually realized that it would take all day to make the journey at that rate. On the return route, with lighter traffic and more open landscape, we were able to spot more diverse animals around us. For me, the highlights were probably seeing a mother ‘gator with a whole clutch of babies, and watching the feeding behavior of a pair of rare Roseate Spoonbills. Getting to see the ever-changing nature of the ecosystem around me, up close, was also educational. Much like the experience of seeing the vastness of the landscape first-hand, my understanding of the soil and water interplay in the marsh was significantly enhanced by seeing it laid out before me. Inches of elevation separated wet spots from dry ones, and dictated what types of wildlife used each area. While it may not seem like it from the ground, this area really is a “valley,” one of two main routes that freshwater travels through the Everglades on its way to the sea. Especially in the dry season, the water moves very slowly, too slowly to really see it flow. However, it was clear that local fluctuations in water level were occurring, because in places the “periphyton” had been lifted off the soil and rock underneath, and caught up in the grasses. This substance is full of life and nutrients for the plants and animals of the prairies and marshes: it is made up of finely crushed sea shells and detritus, and filled with tiny microbes, algae and bacteria. To those of us used to more conventional landscapes, the slow-draining marl soil looks mucky, dirty, even unhealthy. On the contrary, though, it is an indicator of the vibrance of the Everglades and all the life within it! To sum things up, the Shark Valley trail is a long, flat, reasonably well-paved trail with no shade or wind breaks. It is crowed with tourists and the rental bikes are dodgy. But I promise that you won’t remember any of that (or much of it) after your full journey. Plan to take at least fifteen minutes at the observation tower, and leave the bulk of your time for the return trail heading back north, so that you can stop and observe wildlife and the landscape around you. Bring more water and snacks than you think you’ll need, because it really does get hot out there. Don’t forget the sunscreen! There are toilets at the Observation Tower and Visitor Center, but you’ll need to hold it along the rest of the trail. If you put in a little planning, get an early start (you can leave even earlier with your own bike), and have the right attitude you definitely won’t regret your visit here! If you’re looking at the Midway Campground online and thinking that maybe it is more amenable than you are imagining, it isn’t. It is exactly what it says, and it does a fine job of being that, but it is definitely not more! There is a small lake/pond with some sites around it, with the bulk of the sites grouped together closer to the highway. The sites are pretty close together, with no physical or visual barrier between them. Our site was definitely not one of the best, and we could see and hear the highway from our location. Realistically, though, there is not a lot of traffic on the road after dark. There are flush toilets, drinking water, and a dump station. There is no shade, except for some shared roofed pavilions scattered around. The lack of shade, however, also means fewer mosquitoes (not none, of course, you’re in a giant swamp after all)! The ground may be slightly damp, but it isn’t soggy, at least under normal dry-season conditions. I took a little walk around the pond to stretch my legs, but otherwise there are no walking trails accessible from the campground. However, the Oasis Visitor Center is more or less across the road so you’re just a short drive (or longer walk) away. All in all, our stay there had a functional purpose, but it was reasonably pleasant. Being as close as we were to our neighbors, we couldn’t help but interact, and I had some interesting conversations and shared some campsite tools. In fact, the next site over contained the same family that we had met hiking on the Gator Hook Trail that afternoon. They were Canadians who had rented a small RV van to tour for a couple months, and they showed me their whole setup which was neat. That said, if you don’t want people looking at how your vehicle is packed, there’s not much you can do about it. I imagine rowdy neighbors would get old quickly. There didn’t seem to be safety issues there, but it was so close to the highway and so exposed that it felt less secure than usual. This may have been just my perception though. The Roberts Lake Trail runs roughly north to south from the Tamiami Trail (US 41) to the gravel Loop Road for a distance of about 7 miles. It is one of the southernmost segments of the Florida Trail. I am ONLY reviewing the northern 3 miles or so here, which I did as an out-and-back hike. The draw of this trail as a day hike is getting to an old-growth stand of bald cypress, which was neat but not incredibly impressive. The trail itself is fine but wet and somewhat monotonous. I’m glad I hiked it, but if you only have time for one day hike at Big Cypress National Preserve, I think you can do better. As usual in south Florida, the terrain here is flat. The trail is quite well worn in most places, so it is easy to find, but that has caused the actual surface of the trail to become slightly lower and more compact than the surrounding landscape. In Big Cypress, that means that it holds water most of the time. You definitely will not be able to keep your feet dry on this trail! While that is par for the course in this region and not really a problem, the sloshing gets old after a while. I also found that I got tired more quickly than I expected from keeping my balance and pulling my feet out of the mud repeatedly. And finally, the murky water obscured holes in the bedrock and incipient cypress knees, resulting in sore toes after a while from all the bumping. Remember, though, that the ecology here is fragile – it won’t do you any good to walk off the trail, as your feet will get thoroughly wet just down the road! The trail passes through several of the ecosystems that are tiled together throughout the mosaic of the Everglades region. You will see bald cypress domes, small areas of hardwood hammock, and a lot of prairie dotted with pond cypress. Most of the trail does not have much shade, which also means that the mosquito situation is tolerable. I saw a few interesting wildflowers along the way, but not as much diversity as on other trails that I hiked in the region. We selected this hike on the recommendation of a seasonal ranger in the Oasis Visitor Center who told us about a stand of old-growth cypress a couple miles in. I’m pretty sure we found it, because we came to a stand that seemed more diverse than some others I had been in, and seemed to contain more and larger trees in “fairy ring” formations. A word of caution if you’re excited about large old trees: the “big” in Big Cypress refers to the size of the swamp region itself, not necessarily to the trees in it. Bald cypresses can get to be good-sized, but they grow very slowly over their 600 year lifespan, so the girth and height never reach really huge proportions. If you want to check out this particular stand, ask at the Visitor Center for instructions on how to find it (which are something along the line of, “when the trail jogs, keep going east until you get to some bigger trees”). While the trail itself is well-marked with Florida Trail posts and periodic blazes, a compass or GPS will be handy if you plan to venture off to find this stand – it is easy to get turned around in the swamp! Tip: On a map, it seems like this trailhead is just across the road from the Oasis Visitor Center. In fact, you’ll have to walk down the highway a bit to get there, which feels longer than it really is. Note: Returning at dusk, we encountered several smaller cottonmouths curled up on the trail. With cooler temperatures, they were not extremely active, and I personally thought they were cool to see up close! I don’t know if it was the location, the time of day, or the time of year that brought them there, but if you are not a fan of snakes you might want to ask in the Visitor Center to see if they frequent this trail more than others. Have you hiked the Roberts Lake Trail? Do you agree with the rating, or have anything to add? Comment below! This is a fun out-and-back trail leading through several of the ecosystems that comprise Big Cypress National Park, though primarily through a variety of cypress stands. Warning: the mosquitoes here were the worst that I experienced on my whole trip – bring a head net or bug suit! It is possible that I would have ranked this trail a little lower right after I hiked it, more like a 3/5, but almost two years later the great experience is still sticking with me, so I think it deserves recognition for that! Like everything else in south Florida, the terrain on the Gator Hook Trail is flat. The trail travels primarily east-west, but there is enough curvature that you rarely feel like you can see the trail far ahead. It is clearly actively and safely maintained by brush and tree clearing. However, due to minor elevation changes and surface bedrock, the trail surface changes frequently and the footing can be difficult. Most of the trail was dry when we were there in late February, but we had to do some rock-hopping and log-balancing, and eventually reached a point where we had no choice but to slog through the water. These aren’t complaints – it is just the way hiking is in this area – but you should bring appropriate footwear for the situation. Also remember that the ecology here is fragile – try not to walk off the trail just to avoid a little water, you cannot keep from getting wet in the long run! The trail is well-marked with blazes… until it isn’t. For much of the distance, there is a well-beaten path, but after a while it is clear that the trail becomes less frequently traveled. We had to start searching for the next blaze, sometimes walking in a couple different directions until we found it. I’m not sure if we reached the end of the trail or not, but we eventually couldn’t find any more blazes or see any convincing evidence of a footpath. This, the fact that it just peters out after a while, is my only real negative to the Gator Hook Trail. There were several other hikers when we were out there, but my sense is that most of them didn’t hike the whole way. That is, we saw more people closer to the parking lot (which is large and easy to find) than farther out. They probably got scared away by the bugs! There are not many hiking trails in the area (since it is 4,000 square miles of wetland after all), so it stands to reason that signed and maintained trails would be used extensively. That said, I was eager to be able to take a hike out into this wetland under my own power and it didn’t disappoint! My favorite part of the Gator Hook Trail was observing the changing surface under my feet and the corresponding change in vegetation around me. The ecology of the region is completely dependent on small changes in water level, so small changes in elevation or holes in the karst bedrock would create different ecosystems within the greater region. I had read about this, and been told about it, but actually walking around in it helped me to understand so much better! Plus, it was cool to actually see and touch these features! Have you hiked the Gator Hook Trail? Comment below and let me and your fellow travelers know what your experience was like! One of my favorite trip planning methods is poring over a map and deciding what looks interesting! As I did that for south Florida, I discovered another National Park Service property tucked into the Everglades National Park: Big Cypress National Preserve. The name alone intrigued me, and I was curious about its separate designation within the Everglades ecosystem, so I decided to investigate. I learned that Big Cypress consisted largely of cypress swamp, that it is the primary range for the last remaining Florida panthers, and that its National Preserve status meant that it was more developed for recreational use than Everglades National Park. What my internet research did not tell me is that the mosquitoes are horrendous! I guess the “swamp” part was supposed to give that away. We spent two nights at the Midway campground, went on a couple of long hikes, attended a fun ranger-led program, and drove the scenic loop road, all of which were well worth it! These were conveniently located in a small area just off of the Tamiami Trail (US 41), but I would happily go back to explore some parts of the huge (729,000 acre) preserve that did not get my attention this first time. I read, but didn’t really understand until I got there, how the cypress swamps fit in to the overall Everglades ecosystem. Rather than being a vast area of forested wetland, which is what I picture from Midwestern swamps, the cypress stands are spread in patches within the freshwater marsh. These patches exist in areas of slightly increased elevation above the grassland. When I say “slightly,” I mean a difference of a few feet! Cypresses are wetland trees, they need to be flooded much of the year, but they also n eed a spot that is periodically dry for their seed cones to germinate. During the wet (summer) season, they are inundated by the broad, flat river of water flowing from the north towards the sea, while during the dry (winter) season, patches of dry ground are found within the stands. There are two species in the area: Bald Cypress and Pond Cypress, and both grow either along rivers (called a “strand” of cypress) or in circular patches (called “domes”). Within a cypress dome, the tallest trees grow in the center, and we were taught that the height of the trees roughly mirrors the depth of the water – the tallest trees in the deepest water, while the shortest ones were in shallower areas. Cypress trees grow tall and straight, but they have to have some way to stabilize themselves in mucky soil and changing water levels over their long lives. They grow structures on their lower trunk that look like buttresses, and sprout “knees” all around to help hold themselves up. A final fun fact about cypresses is that they are deciduous conifers – they reproduce via cones, but lose their needles annually and regrow them (maybe why they were named “bald?”). Our first hike, picked from several recommended at the visitor center, was on the Gator Hook Trail. It mostly followed a series of cypress stands and was therefore well shaded – and full of mosquitoes!! It was actually an awesome experience, but we realized that we’d forgotten our head nets. Don’t leave those behind!! The second afternoon we headed south from the highway on the Roberts Lake Trail, which is part of the Florida Trail. We did not make it all the way to the backpacking campsite, but turned around when we felt we were ready. There was a lot more open grassland on this trail, and smaller Pond Cypress trees, so overall our feet got wetter, but there were fewer bugs. It was neat to see a different aspect of the same ecosystems. You can read more about both trails and the Midway campground on my subsequent Trail Review and Campground Review posts! The Swamp Walk program, led by a seasonal park ranger, was pretty cool even though group tours aren’t really my thing. The ranger led us off-trail into a cypress dome, talked about ecology, and took us into an alligator hole to see what we could see. We didn’t go that far, but it wasn’t necessarily easy going, as we were standing in water most of the time, sometimes almost waist-deep. The pace was easy, and there was lots of standing-around time as he answered questions for the group. this case it was useful to be able to stand in one place and look more closely at the new ecosystem I was learning. Other visitors often asked questions that hadn’t occurred to me, so I probably both learned and observed more than I would have on my own. The ‘gator hole. Sadly… and gladly… there was no activity when we stopped there. Tip: The park provided walking sticks (basically long dowel rods) for the tour, and we were able to keep them “checked out” for our afternoon hike. Ask to borrow one at the Visitor Center for your hike, and use their handy hose outside to rinse off when you’re done! Looking at the ground in a cypress stand, it seems rather barren – it is either water or muddy, peaty soil with few plants growing in the dark shade and flooded terrain. Looking up, however, it turns out that the trees themselves are what the rest of the ecosystem is based on. A variety of air plants and mosses hang from the trunk and branches, and land-based plants find root where soil and water accumulate in bends of the cypress knees. Palmetto shrubs sprout where they can get a foothold, and then suddenly the dome gives way to its outer fringes and grasses and flowers are all around! Alligators aren’t the only amphibious reptiles in the park, with snakes and lizards frequently present when I stopped to look. On the Loop Road drive, we also had an opportunity to see many of the iconic wetland birds of the region. It was a pleasant drive, primarily through desolate cypress swamps and hardwood hammock, with some pines thrown in. Given all of the other experiences we had in the region, I don’t think this added a lot to the overall trip, but it was nice to have a relaxing drive between strenuous physical activities. If you are not spending much time in the area, this is a great way to get a sense of it along with a few photo ops. At the east end, it became much more developed and our early morning drive coincided with local residents leaving to get to work. This was an interesting reminder of the origin and management of Big Cypress National Preserve. It was created in the 1970s, after residential development had begun, to protect the are from large-scale commercial development. Due to the flat, relatively treeless landscape, there had been plans to construct the largest “jetport” in the world in the middle of this fragile ecosystem, forever disrupting the flow of water and irreparably disturbing the animals and plants that depended on it. When Big Cypress was established, it was done with the cooperation of local residents as well as native tribes, who wanted it to remain open for traditional uses. This is why the park is developed with swamp buggy/ATV trails, airboat trails and campgrounds, is open for regular hunting seasons, and contains both tribal villages and modern western subdivisions in places. Despite this, it feels like a truly wild place, because the annual floods make permanent development or use nearly impossible over most of the vast area. Definitely one to put on your list for exploration!! The mangroves that we saw at power-boat speed in the Ten Thousand Islands looked like identical, homogeneous, round, dark green clumps – not very interesting to look at and not much to explore. 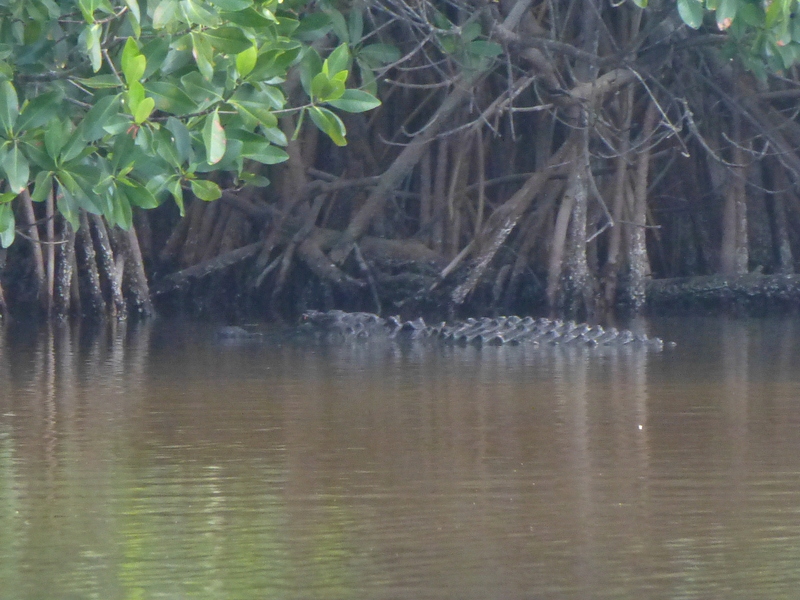 Paddling among the mangroves yielded a different picture! 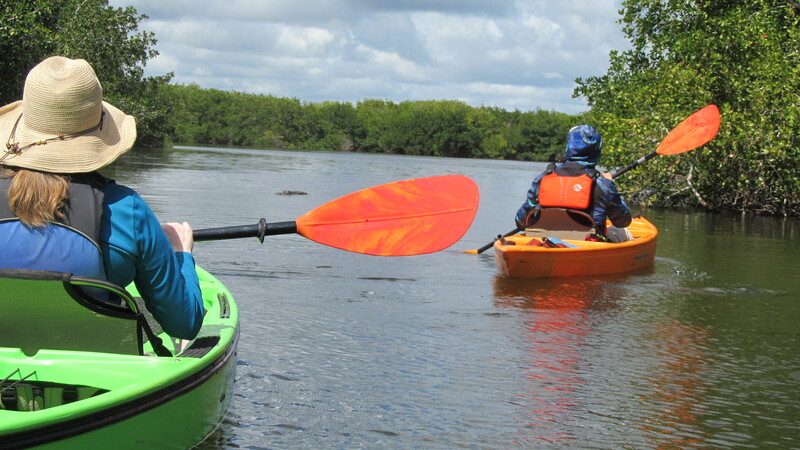 It turns out that the mangroves themselves are fascinating plants, and our time on the water certainly felt like an adventure into the wilderness – glad we had guides to help us along! The first morning of our trip, we got up early and met our Shurr Adventures guide in a crossroads parking lot. The East River was just a few miles down the road, and the kayaks were soon unloaded! Our guide was a bit apprehensive to find out he’d be leading a couple of naturalist-types, but he seemed pleasantly surprised to learn that we already felt comfortable in the boats. He got us out on the slow-moving river (in the dry season, the current wasn’t very apparent) and immediately set out to find us some alligators! It was definitely a new experience to be that close, nearly at water level, with those powerful creatures, and we got some tips on how to avoid irritating them, along with a few facts about their biology. On our half-day trip we were able to see a few different ecosystems in that general area, from the shallow mangroves to a marl flat, to the pine savannas in the distance. This was a great introduction to the systems that we would be exploring for the next week! 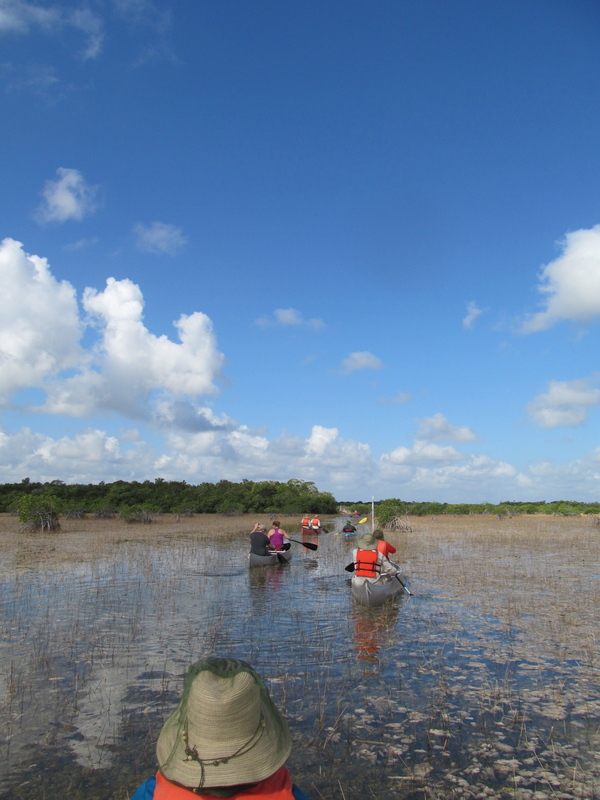 We got out in boats again towards the end of our trip, joining a seasonal ranger from Everglades National Park in a group paddle at Nine Mile Pond. If you are able to, I strongly recommend getting in on one of these trips, as they provide all of the necessary gear and it is entirely free of charge (advance sign-up is required). By this point in our trip, we did not learn much that was new to us, nor did we see anything we hadn’t seen before, but it was certainly a pleasant way to spend the morning. Nine Mile Pond is also a different ecosystem from the East River – it is not an estuary but entirely fresh water, and mangroves don’t naturally occur there; instead they were blown inland in a strong hurricane a couple of decades ago and have thrived since then. The trail therefore also passes through sawgrass prairies, one of the main freshwater ecosystems of the park. The five-mile Canoe Trail (we did half of it) is well-marked with PVC posts, and is therefore definitely very do-able on your own, even if you are not an experienced paddler (but again, the free Park Service program is a great deal if you don’t already have a boat!). An often-overlooked aspect of Everglades National Park is that about 50% of it is covered with water… but only a few feet. The Ten Thousand Islands is so-called because of the many mangrove islets that dot the tidal flats for over a hundred square miles before giving way to the open Gulf of Mexico. This is an estuary: a place where fresh water from the rivers meets salt water from the ocean. This brackish water that results in estuaries forms the basis for the most productive and diverse ecosystems on earth – and the 10,000 Islands are no exception! These pelicans are standing on an oyster bar, a few hours before low tide. the mangrove roots, some other plants are able to gain a footing themselves. The outermost islands in the Ten Thousand Islands are true barrier islands, made of sand and shells and supporting a variety of hardy plants that grow above the high-tide line. A Brown Pelican, Double-crested Cormorant, and Royal Tern stake out posts on a shoal as they wait for a meal to swim by. Some visitors spend their entire vacation in the Ten Thousand Islands – paddling or boating, fishing, birding, camping. We had other stops to make, and only spent an afternoon here. We took a private boat tour out among the islands and saw an abundance of wildlife, both mangrove and barrier islands, and capped it off with a sunset over the ocean. All of the boat operators know how to find dolphins for the tourists! It was admittedly fun to watch them play in the wake of the boat. of his ecological facts turned out to be true (I don’t blame him – I think he thought he was giving us accurate information). This was a pattern I noticed while we were down there, that most tour guides (both park staff and private companies) had memorized a little bit of information but couldn’t really extrapolate from that, and sometimes mixed up what they had learned. This is a very heavily-visited area, and most people don’t wonder about the things I’m interested in… but if you do, I suggest reading up before you go, rather than relying on guides or interpreters to inform you! Final note: last fall I read a novel called Swamplandia! by Karen Russell, which takes place in a fictionalized version of the Ten Thousand Islands and southwest Florida. If you’re looking for something less science-y to read, I highly recommend it.